It’s hard to pin down what exactly constitutes a gadget in a game. Certain items have exceptional properties, however I wouldn’t consider them gadgets. Though I suppose if it does something super cool, it can be thrown into the ring for the title. 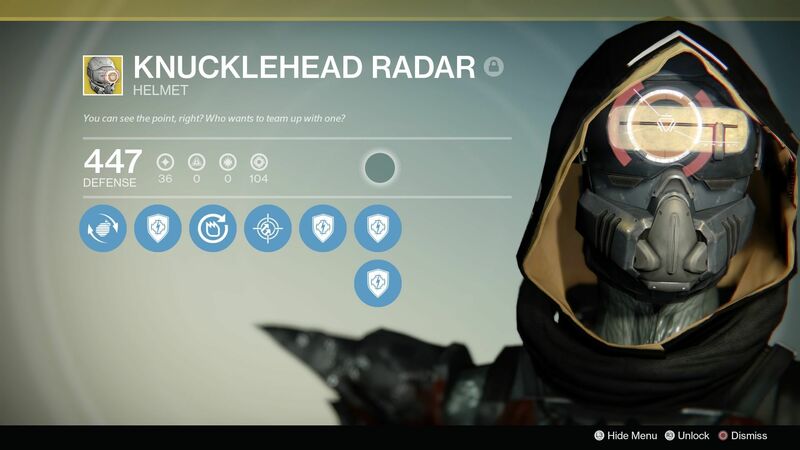 The most useful gadget that comes to mind is one of the exotic helmets I have for my Hunter in Destiny: the Knucklehead Radar. The most useful feature of the helmet is that it allows my radar to remain visible while aiming a primary weapon. This might not sound like a big deal, but I can’t think of a more useful feature. In PVE, I enjoy aiming. I like that I can turn invisible and aim and wait for whatever moment I choose. But in PVP, it’s borderline necessary. I love that I can tote around my Thorn pistol, aim down the sights, and still know if some jerk is sneaking up behind me. And in PVP, they usually are. 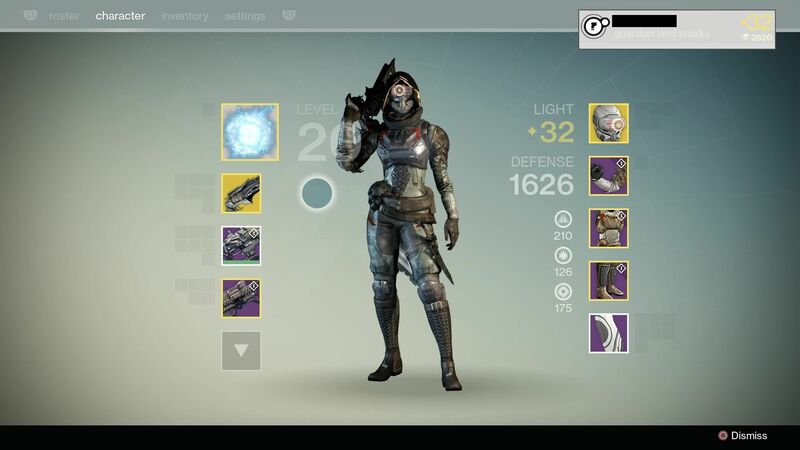 For funsies I thought I’d include a full shot of my Hunter wearing the helmet. Don’t I look fetching? The most elegant gadget has to belong to Okami: the Celestial Brush. As you progress through the game (which is done in a jaw-droppingly beautiful traditional Japanese art style), you encounter thirteen different Celestial Brush gods, each of which teaches you a new technique. You use these techniques for anything from blooming withered trees, to creating lily pads to get across stretches of water. I was originally told about this game by a friend (he played it on the Wii), and when I tried it on the Wii, I was frustrated at the lack of precision in the controls. When I tried it on PS2, I was hooked. It was far easier to control with a standard controller. When the HD remake hit the PSN for PS3, I didn’t hesitate to repurchase the game, and I’m so pleased I did. It’s one of the most incredibly beautiful games I’ve had the privilege to play, and using the Celestial Brush made you feel so wonderful to bring life back to the land. As a side note, if you’ve never played Okami and have access to either a PS3 or PS2, I highly recommend giving it a shot. It’s a beautiful experience and one of the highlights of my gaming life. 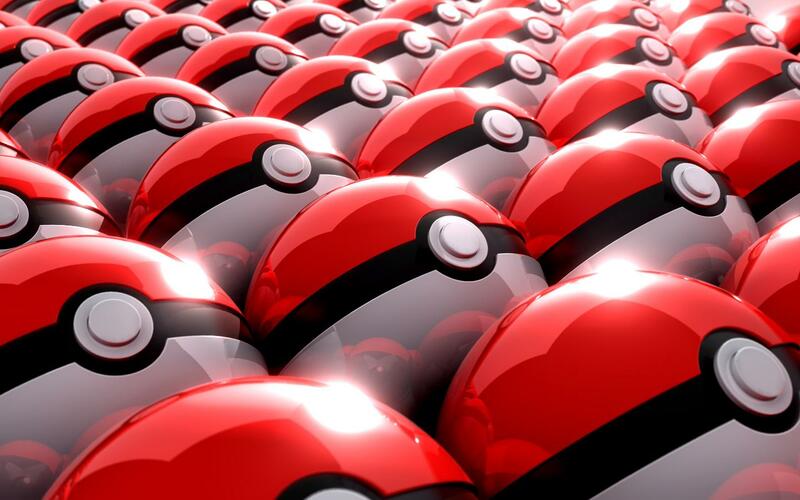 Last, and perhaps least, is the most devious of all gaming gadgets: the Pokeball. Pokeballs are the place your Pokemon “hang out” between battles. Let’s be real here. They are prisons. Tiny, spherical, Pokeprisons. In the Pokemon lore, the Pokeball converts the Pokemon into energy, and stores it inside. That doesn’t sound any better. Why would I want to trap my adorable Pokemon in a tiny ball to only release them when I want them to fight an arbitrary battle for me? And yet I quite enjoyed Pokemon X. The more I think about it, the more conflicted I feel about it. Those poor adorable Pokemon. I almost feel sad ending on that note, so allow me to share this heartening image I found of a Totoro / Pikachu crossover. It makes me smile each time I see it. And it requires no gadgets to appreciate. Other than eyeballs and perhaps contacts or glasses. PIKACHU/TOTORO! That is seriously one of the cutest things I’ve seen. i know, right?! 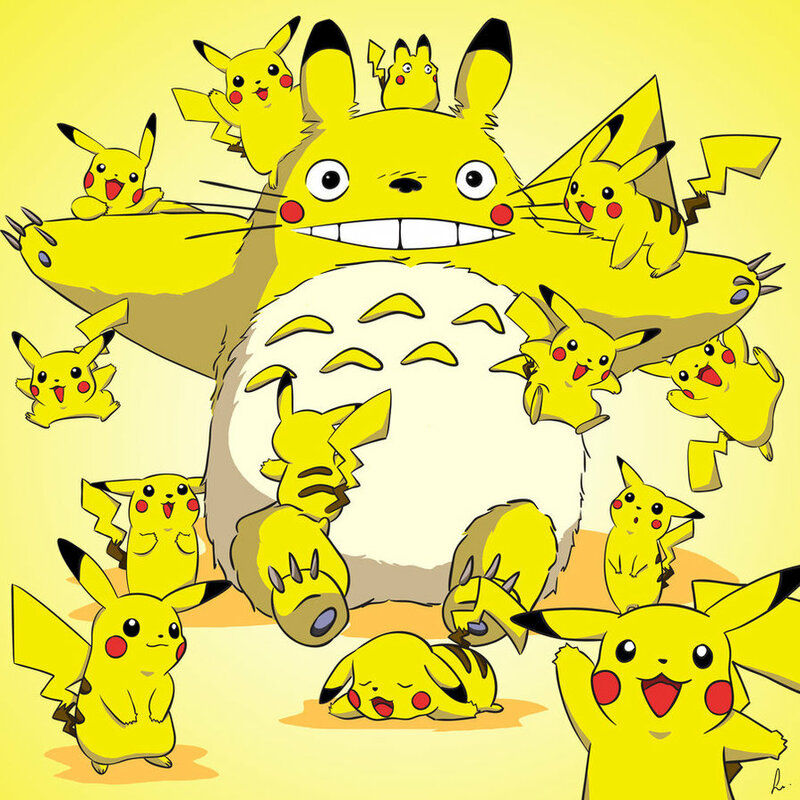 i can completely picture totoro dressing up as pikachu and toddling around the japanese countryside. The Celestial Brush is an excellent and elegant choice. I really need to play Okami. omg, yes. if nothing else, since you have a 3ds now, you should get okamiden. While stretching the word “gadget” a bit, I think if there was ever one game item I’d want in real life, it’s Prince of Persia’s Dagger of Time. Far too many awkward conversations and late comebacks would be saved by one of those. i was definitely stretching the definition of gadget! aww, you’d really want to erase awkward conversations? sometimes those are the best. as for comebacks…you’ve got me there. i’ve thought of far too many after the fact. Actually just finished The Sands of Time for the first… time. So true about the dagger, you could take back “no take backs”! As a lifelong lover of video games I feel like I should be able to think of many cool gaming gadgets, but I’m drawing a blank. I really can’t see past Batman: Arkham Asylum which I think is kind of low hanging fruit. I mean, we all know how Batman relies on his complicated toys. Really cool gadgets though. I loved spraying the explosive foam in random places and detonating it when unsuspecting baddies patrolled nearby. They really should see it coming, it’s always applied in the shape of a bat! Oh, the Portal Gun! I can never think of the Portal Gun whenever the topic is appropriate! Would LOVE one of those! oh dear, that would be tragic for me. i’d forever be falling through the ceiling. i should steer clear of the portal gun. though i would completely take one of those flattering orange jumpsuit things. you know what’s funny? i, too, had an incredibly hard time figuring out a gadget aside from batman’s cadre of tools! explosive foam bats!!! honestly, the baddies really have no excuse. it’s wicked obvious. I’m not good at playing on consoles, but I was glad that I took the chance to play Okamiden on the DS. It was a game that I bought as a sort of afterthought, but it’s one of the games that I played front to end, and started it again for a second run. Like you said, this one is so beautiful too, and the story so poignant. 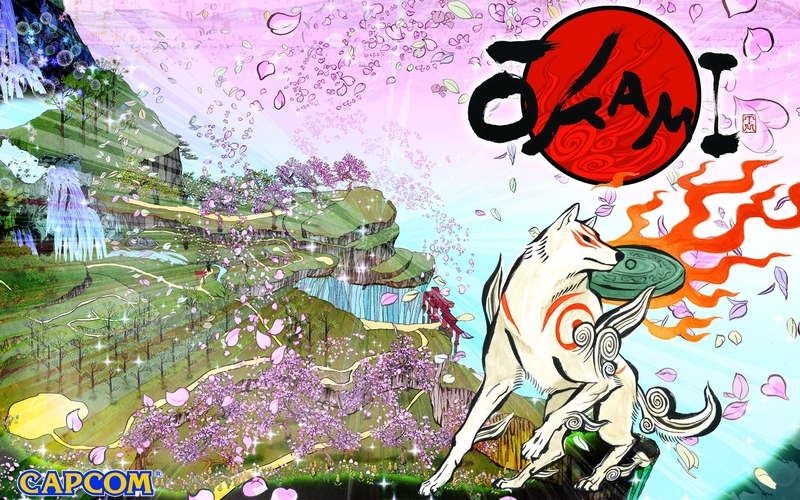 I can only imagine that the experience of Okami is even better. honestly, with how much it sounds like you play your 3ds, you would be perfectly good on consoles. i have no doubt about it.